You can now select multiple folders of images at the same time. All will be combined into one PowerPoint slideshow. You can choose a top level folder or folders and the script will select all jpeg or jpg images within the folder(s). Once the zipped file is downloaded, double-click to un-zip the app and save it to your desktop or elsewhere for future use. Simply double-click the app, navigate to the image folder(s), select, and click on choose. A PowerPoint slideshow will be created with the images. Note that it’s best to not have an already existing PowerPoint slideshow open when you do this. As with the previous importing workflow, if you have images that are 1024 pixels wide but taller than 768 (or an equivalent ratio), you will see that the images bleed off the bottom of the slide. It’s fairly easy to spot these and resize them as needed. Many people with soaMDID accounts prefer to use PowerPoint as their presentation tool. There is a relatively simple way to export groups of images from soaMDID; it’s called Package. I have a document that explains how to Package. After you have the resulting folder of images, you can then go to this earlier posting to learn how to load all the images into PowerPoint at one time. If you prefer to not be tied to your computer keyboard while giving an MDID or PowerPoint presentation, then it may be worth buying a presentation remote. 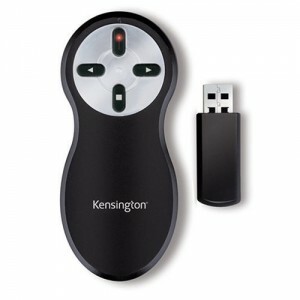 There are a wide variety of remotes out there, but my favorite is made by Kensington. It is available on Amazon for under $35. It has buttons for forward, reverse, and blanking the screen, plus it has a laser pointer. A newer version also has 2gb of memory on the receiver so that it can double as a USB drive. It costs around $50. Windows users of PowerPoint (PP) have the option of importing folders full of images into PowerPoint using the Photo Album feature. This is possible in PP2010, PP2007 and PP2003. PP on Macs does not have this feature, but there are workarounds. For the 2004 version of PP, there is an AppleScript application that will do this. For the 2008 version, an Automator workflow can be used. Below are links and notes for those. NOTE: if your computer is running Snow Leopard (OS 10.6), you need to use the image importer in this entry instead.